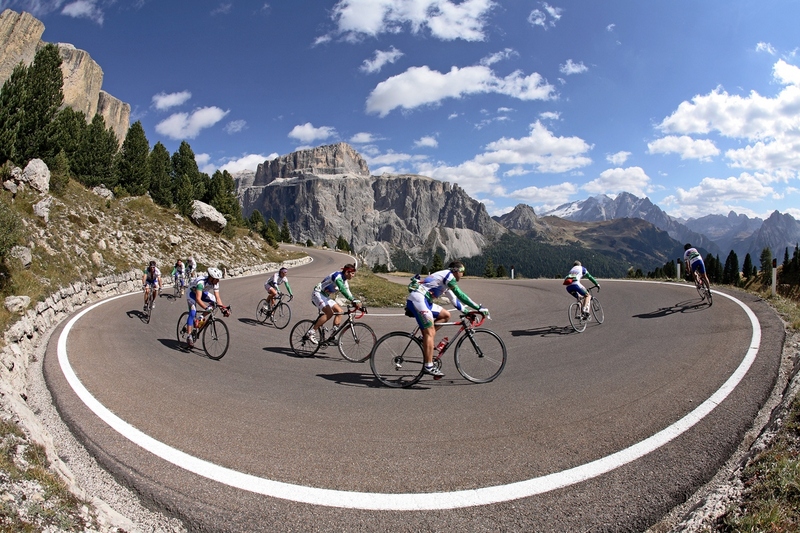 You’ll face spectacular mountain passes on this cycle the Dolomites Tour. You cycle over safe roads and leave the heavy traffic routes behind you. The Dolomites in North Italy are perfectly located in the northeast corner of Italy near Switzerland and Austria. So jump on your bike and go for it. 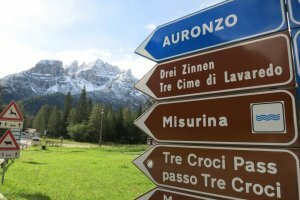 Guided Dolomites road cycling Tour 2019. From May until October 1. From 6 persons or more. 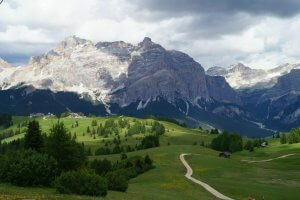 The mighty Dolomites in North Italy are perfectly located in the northeast corner of Italy near Switzerland and Austria. 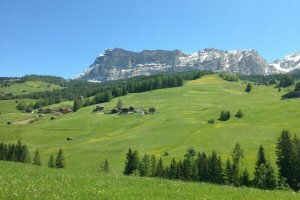 This stunning area has one of the most spectacular mountain ranges in the European Alps. 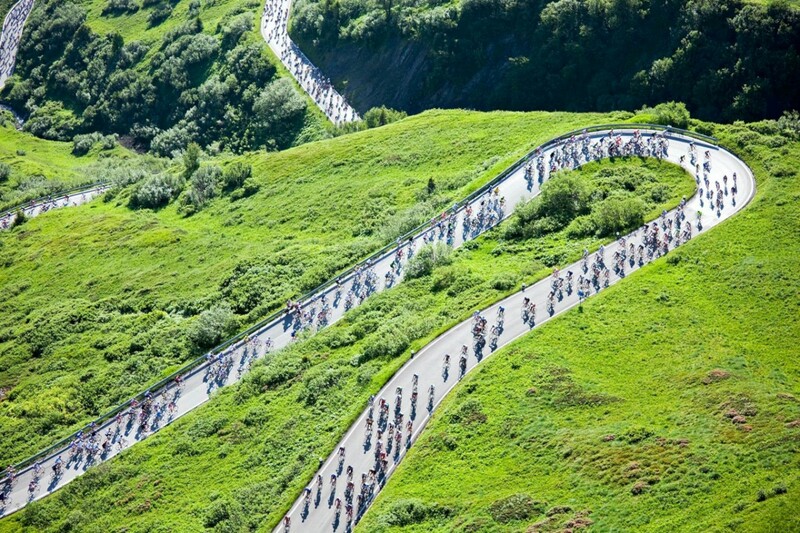 The Dolomites are a real cycling paradise for every keen cyclist. Here you’ll experience one of the most challenging cycling tracks and mythical climbs. The Grande Strada delle Dolomiti (Great Dolomites Road) makes cycling perfect due to the good asphalt and scenic roads. 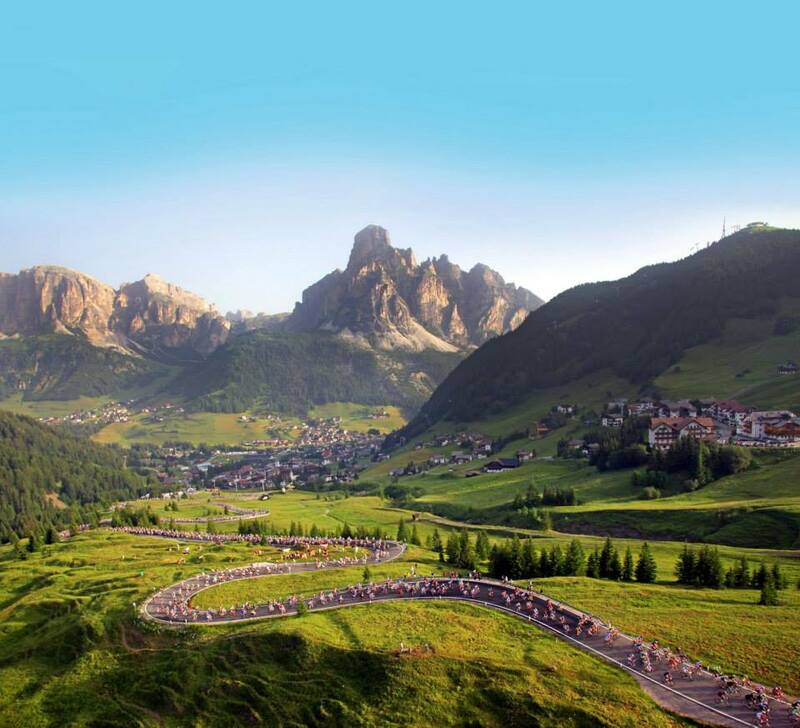 This terrain is famous because for its biggest Gran Fondo event in Italy: the Maratona dles Dolomites. You can climb many incredible mountain summits of the Giro d’Italia. The Dolomites climbs to Passo Sella, Passo San Pelligrino, the Italian Alps in the North of Italy with two giant climbs to the Passo dello Stelvio and The Gavia pass. Two incredible road passes where some of the greatest battles have taken place during the Giro d’Italia. You start your Italian cycling adventure with a nice short stage from Trento to Cavalese via the Passo Manghen. 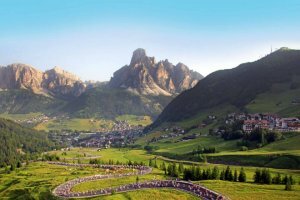 The Passo Manghen lies in the middle of the Trentino Alto Dolomites ranges. The start of the climb is in Borgo Valsugana over the Passo Manghen, the climb has an average percentage of 7.1 %. Distance: 82km. Height gain: 2360m. Max. altitude: 2027m. You leave Cavalese behind us for a nice stage and ride to the heart of the Dolimiti Bellunesi National Park. The park remains largely wild and remote. Named for the Dolomites, the majestic mountain range is rich in flora, fauna and fantastic views. Later you’ll ride through the protected forest of Paneveggio where Stradivari used to choose the trees with which to make his famous Stradivarius violins. Distance: 119km. Height gain: 2340m. Max. altitude: 1968m. 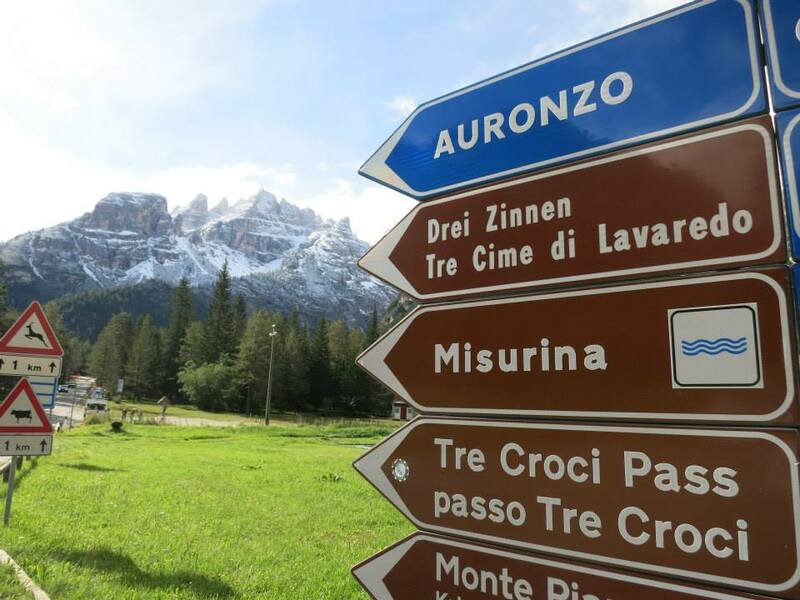 Today, you’ll cycle around the Marmolada tower, also known as the Queen of the Dolomites and one of the highest summit of the Dolomites, which culminates at 3342m. You’ll also climb the magnificent Passo San Pellegrino, which will offer you magnificent views over the Monte Pelmo. Distance: 84km. Height gain: 2650m. Max. altitude: 2080m. Sella Ronda day! 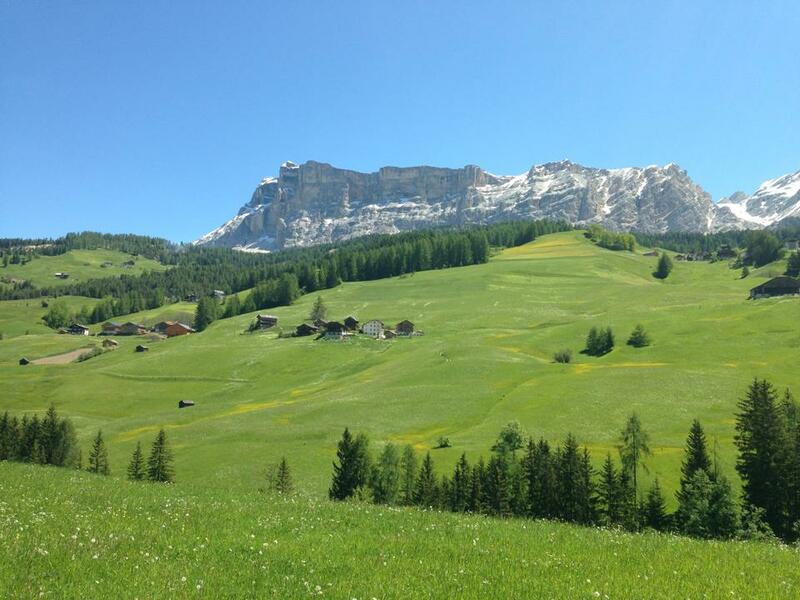 The Sella Ronda is a classic ride: it is the tour of the Monte Sella. Today, you’ll cross the Paso Sella, a road pass which culminates at 2240m. It was twice the Cima Coppi du Giro (the highest road pass in the Giro d'Italia). Distance: 74km. Height gain: 1980m. Max. altitude: 2067m. Today you’ll have a short and easy stage. You’ll climb Passo du Costalunga along the Carezza Lake up to Bolzano. After riding the pass, you’ll start a swooping descent before reaching your accommodation. After arriving in your hotel you’ll be able to visit Bolzano and Merano and to rest for a while before tomorrow’s challengers ride to Passo dello Stelvio. Distance: 68km. Height gain: 720m. Max. altitude: 1792m. This is one of the journey’s most spectacular and unforgettable rides! The two giant mountains which you’ll tackle today are two legendary road passes. The Passo dello Stelvio and the Passo di Gavia are two incredible road passes where some of the most legendary battles have taken place during the Giro d’Italia. 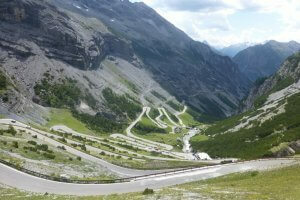 You’ll climb the famous Stelvio, "attack this mountain with respect". The climb has 48 switchbacks to tackle with it’s top on 2757m (9045ft). 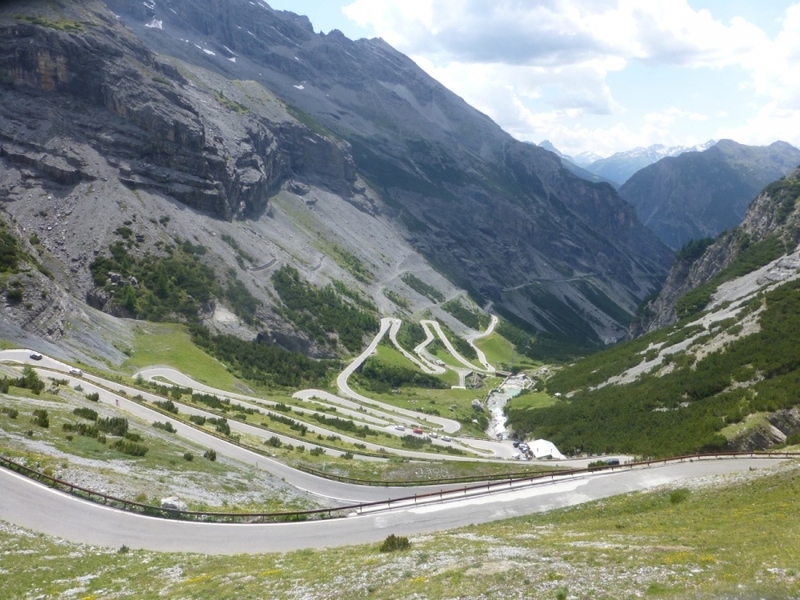 After the Stelvio you’ll face the Gavia pass. The mountain belongs to one of the highest paved mountain passes in the Alps. The Gavia has a high summit of 2621 meters (8700ft). 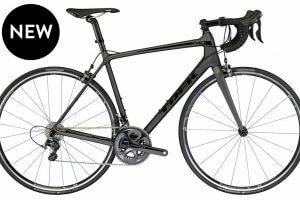 Easier option: Distance: 109km. The last stage. Another great stage with three road passes to climb and the last ones of the entire week! The first road pass is close to a famous ski resort, situated at the foot of some glaciers where you can see all year round. You will finish today’s stage with a climb up the Monte Bondone, which has often been crossed through the Giro d’Italia. You will then return to Trento. Distance: 158km. Height gain: 3300m. Max. altitude: 1875m. 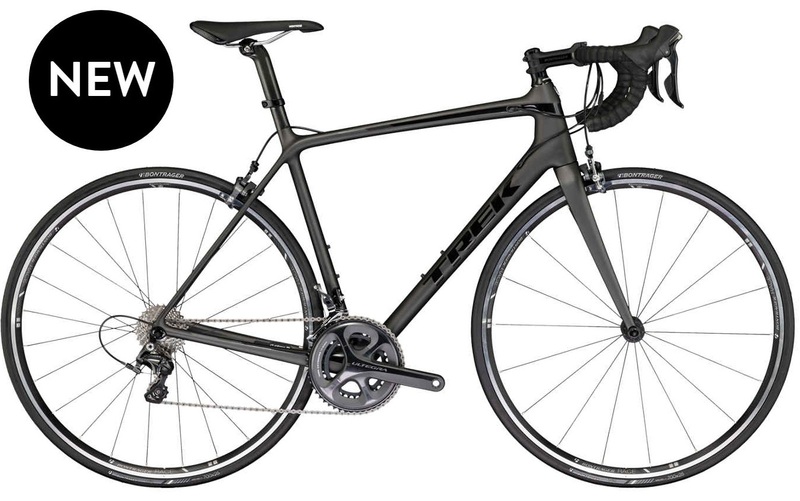 Easier option: Distance: 96km. Height gain: 1310m. Max. altitude: 1875m. Your cycling holiday ends after breakfast. Please contact us if you wish to book an extra night in this beautiful region!